Passengers hoping to board their departing flights at Phuket International Airport on time are strongly advised to arrive early as confusion over which terminal to depart from and long immigration queues have plagued travellers since the opening of the new International Terminal on last Friday (Sept 16). The official opening of the new International Terminal, dedicated by Prime Minister Gen Prayut Chan-o-cha, on Friday has left many travellers confused over which terminal to depart from, one senior Airports of Thailand* staffer, who asked not to be named, told The Phuket News. “Since the opening of the new International Terminal, many passengers are not sure where to check-in and most drivers just drop off passengers at the old terminal,” he said. “We have even seen some passengers drag their luggage from terminal to the other,” he added. The new terminal, as its name indicates, is dedicated to international flights, while the old terminal is now dedicated to serving domestic flights only, the airport staffer explained. “We are putting up signs to help direct passengers to where they need to be and we now have staff on the concourse to advise them,” he said. “We want the public to know that the old passenger building is for domestic flights only and that the new terminal is for international flights,” he repeated. “It is quite normal for any new facility to have a rough start. We apologise for any inconvenience, but we assure you that it will get better once everything is in place,” he added. 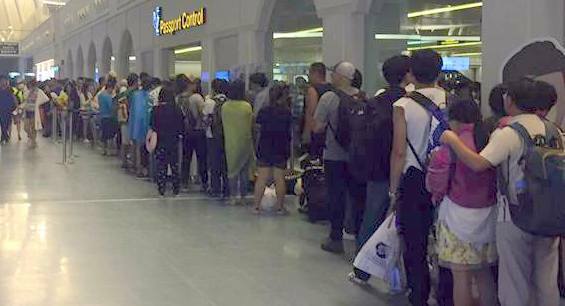 Adding to the delays, however, are long immigration queues taking travellers up to an hour to clear outbound immigration desks. One immigration officer, who also asked not to named, said that the long lines to clear immigration at Phuket Airport was not unusual. The immigration officer pointed out that although the new International Terminal features many outbound immigration counters (34, to be exact), many of the officer stations have yet to be fitted with computer terminals – and that there are not enough immigration officers to man all the stations anyway. “We have only 13 computers that are working with 13 to 14 officers on rotation at the counters,” the officer said. “Some stations still have no computers set up yet. In three months, we hope to get new computers for these stations and extra officers will help out by next week,” the officer said. * Airports of Thailand operates six major international airports in Thailand, including in Phuket.